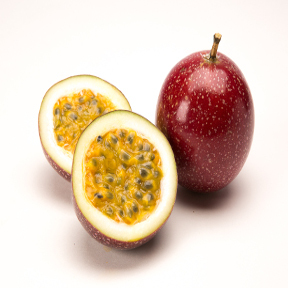 Passion Fruit is a round to oval-shape fruit with a thick, inedible outer rind. Once cut in half, sacs containing light-orange pulpy like jelly is revealed inside, dotted with small edible black seeds. Sweet yet somewhat tart in flavor, the flesh and seeds are edible. Names:Passion Fruit, Granadilla, Purple Granadilla, Yellow Passion Fruit, Parcha, Maracuya. Handling: The most obvious index of fruit maturity is external skin color. As the fruit matures, the skin color will change from green to either yellow or purple, depending on the type of passion fruit.